I was born in Canberra, Australia, and raised by a Chinese Malaysian-born mother and Australian father. During my youth, I used to travel to Malaysia with my Mum every few of years to visit our relatives. My mother’s two sisters are Tibetan Buddhist practitioners: one is a practitioner of the Kagyu school, while the other sister and her husband are both Nyingma practitioners. When I was 19, it was my uncle who requested my Mum and I to go on a Buddhist pilgrimage to India to visit the holy Buddhist sites. My understanding of Buddhism during this trip was really shallow and I was more like a tourist rather than a spiritual pilgrim. I do, however, remember that visiting Bodhgaya – the Buddha’s place of reaching enlightenment – left a deep impression on me and I even started referring to it as one of my “favorite places on earth”. At the end of that trip my uncle conducted a refuge ceremony for me, which made me officially a Buddhist, though I didn’t really know what that meant. I figured it just meant I was accepting Buddha as my sole spiritual guide and it turns out my understanding was actually right. But when I returned to Australia I didn’t pursue any study of Buddhism, or read any books, instead I just got caught up in the life of a normal 19-year-old. I went on to complete a Post Graduate Diploma in Psychology and then a Graduate Diploma in Financial Planning at the University of Canberra. I decided working in the financial field (where the money was) was going to be the path of wealth and happiness for me, so I got a job in a financial planning firm and moved up to the Sunshine Coast (and later the Gold Coast) where I could continue enjoying my love for the beach and surfing. So from the time of my pilgrimage, it took another 7 years before Buddhism re-emerged in my life and it happened in a very unexpected way. My memory of that day is so clear in my mind that I even remember what I was wearing… I was living on the Gold Coast at the time, enjoying the sun, sand and surf, living what would normally be considered an enviable life, but deep down I was unfulfilled and still searching for the meaning of life. One day it finally came to a head and I found myself sobbing at my desk at work. (I was working alone that day, so no one could see me). I kept asking myself again and again, “Why aren’t I happy?” I couldn’t understand it. I had a great job, a car, money, lived 2 minutes from the beach, a great partner and an easy-going, carefree life, so why did my heart feel so… empty? I felt like I was internally screaming, “Why?! Why, aren’t I happy?” Finally, when there was a lull in my internal cries, I suddenly heard a voice say loudly and clearly, “Buddhism”. It was strange, the voice seemed to come from within me, but it wasn’t my own voice. I then felt this intense almost hysteria to find out what Buddhism was actually all about. 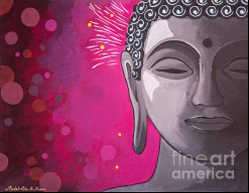 I really only knew that someone wise, named Buddha, had existed, but that was it. Within seconds I had typed ‘Buddhism basics’ into Google and something called the Four Noble Truths popped up. As I began to read these my whole world felt like it shifted. In fact the relief I felt from reading the Four Noble Truths caused me to physically fall back in my chair and take the deepest breath as if I had been holding my breath for a century. I felt like the entire weight of the world was lifted off my shoulders that day. I then developed an insatiable appetite for reading the Buddha’s teachings, starting with The Noble Eightfold Path, which led me into the vast realm of Theravada teachings. It took less than a week before I decided I wanted to move back to Canberra to find a Buddhist center and resume the volunteer work I had been doing with refugees before I had moved to the Gold Coast. Moving back to Canberra, alone, I went in search of a Buddhist center, and specifically in search of a teacher. I went to many different centers: Thai, Sri Lankan, Tibetan, Vietnamese… but none of them had what I was looking for. I just knew in my heart that the teacher I wanted was male, not Australian-born, fluent in English and actually lived in Canberra. Don’t ask me why! It was just what my heart was telling me to search for. I kept searching for months without any luck and eventually resigned to the fact that this person didn’t exist. Almost six months later I decided to revisit my list of centers to see which center had a good weekly schedule. I knew I wanted to immerse myself more in the practice and study, nothing else in ordinary life was of interest to me. So I found one center on my list that had several weekly practices and teachings and I went back there. That’s when I discovered that they actually did have a resident teacher and he completely matched my criteria. I could finally stop searching! Actually even better than finding a teacher was being introduced to the compassion-focused teachings of Mahayana Buddhism, in particular the Vajrayana Buddhist teachings. The center I attended belonged to the Sakya school of Tibetan Buddhism and I found myself eagerly learning the Ngondro (preliminary) practices and Chenrezig (Compassionate Buddha) practice. In fact I threw myself into the teachings, practices and group retreats and within a year I had decided I wanted to become a nun. It just felt like a natural progression for me. (Of course you can still practice Buddhism as a lay person but I had no interest in relationships and wanted to commit myself completely to the study and practice of Buddhism). In December 2005 I travelled with a pilgrimage group to India, led by my teacher, Lama Choedak Rinpoche. I was ordained on this trip by a revered Tibetan Buddhist master named His Eminence Ludhing Khen Rinpoche. After one month in India I returned to Australia, only to go into solitary retreat for 15 months (part of which included a 7-month Ngondro retreat and a 6-month Calm-Abiding meditation retreat). These were practices that I loved deeply and I really desired to practice them in the most in-depth way. I had a lot of physical ailments arise during my Ngondro retreat and as a result I wasn’t able to complete all the prostrations in the one go. I was able to complete them over the course of the 7 months, but only by doing half-length prostrations as opposed to full-length ones. Although technically this was fine, it left a feeling of incompleteness for me. It was around that time I decided I wanted to do a prostration retreat in Bodhgaya (Buddha’s place of enlightenment). One and a half years later I finally got the chance to do this retreat. After going on another pilgrimage to India with Lama Choedak Rinpoche, I stayed behind in India and returned to Bodhgaya. I spent two months prostrating every day and was able to build up to completing about 2,300 prostrations each day. It’s amazing how quickly the body grows accustomed to the movement and it almost becomes effortless. It was at the end of this retreat that I met my husband. I had been a nun for 3 years by this time and was an extremely happy one too! I thought I would die as a nun, but sometimes life has a way of throwing you a curved ball. Anyhow, disrobing as a nun did not dampen my enthusiasm for doing retreats. In fact I told my husband straight up that he would have to wait a few years before I was ready to marry. I had my sights set on resuming and completing the 3-year Lamdre Lobshe retreat. After receiving the additional teachings and empowerments that I needed, I went back into retreat to finish the rest of the Lamdre Lobshe 3-year retreat which I completed in August 2012. There are numerous Buddhist teachers across all three traditions of Buddhism who I would consider exceptional, however, there a few teachers whose teachings have greatly inspired me the most. We meet our teachers based on our own karma and are drawn to certain teachers because of our own personality and pre-dispositions, so my teachers are simply teachers who have inspired me. There are so many good Buddhist teachers out there and I encourage everyone to seek teachers and guides who you feel nurtured and inspired by. Since we’re in an age of connectivity and mass media, I haven’t received all teachings ‘from the warm mouth of the guru’ but sometimes through their published books or online video teachings. My heartfelt thanks goes to Lama Choedak Rinpoche who accelerated my learning and understanding of the Buddhist texts and practices, introduced me to the concept of Bodhicitta (compassionately working towards Enlightenment for the benefit of all), and made my three year retreat possible; to His Holiness the Sakya Trizin who initiated me into the highest Vajrayana practices; to the late Venerable Khenchen Appey Rinpoche who was a living example of compassion and bodhicitta in action; to Jetsunma Tenzin Palmo who inspired me to become a nun and to really put my whole being into the Vajrayana practices; to His Eminence Tsem Tulku Rinpoche whose direct approach to teaching has helped me cut through the confusion in my mind especially during challenging times; to Lama Zopa Rinpoche whose teachings inspire and encourage me to continuously practice virtuous deeds no matter how small; to Ajahn Brahm for introducing me to the Theravada teachings and showing me how Buddhist teachings are directly applicable to our lives; and finally to Pema Chodron whose gentle, nurturing and insightful teachings are a soothing panacea in tough times. To be honest, although I am passionate (and enthusiastic!) about teaching Buddhism, I am very reluctant to call myself a teacher. I am certainly not on the same level as the aforementioned teachers. I still think of myself as a student, and don’t claim to have a vast knowledge of all the teachings or have all the answers. My reason for starting these YouTube videos and website was to provide an online avenue for people to be introduced to the Buddha’s teachings and potentially be a gateway for them to take the next step in finding a Dharma center and teacher. If I can help just one person find more peace, happiness and meaning in their lives through the meditation techniques or Buddhist teachings that I share, then my efforts will have been worthwhile. If I can inspire others to attend Dharma centers and practice and study more, then my goals will have been achieved. I really see my work to be more like fertilizer to help nurture other people’s spiritual paths, in whatever form that might take. I understand, however, that some people may come to view me as their teacher and I will do my best to at least point them in the right direction. May all beings experience the peace and bliss that comes from attaining enlightenment!